This article is about the Coldharbour reconstruction. For the historic Thrassian structure, see Coral Tower (Thras). For the extant Thrassian structure, see Pillar of Thras. The Coral Tower of Coldharbour is a reconstructed imitation of the Coral Tower of Thras. It is located in the Fist of Stone region, in a ship graveyard known as the Lost Fleet. 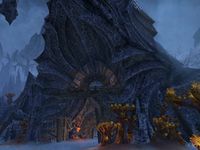 The structure is similar to other Daedric architecture in Coldharbour, wrought from an ebony-alloy cold-iron but with coral from Thras incorporated into its construction. The Coral Tower is located directly beneath a portal that connects Coldharbour to Nirn. This portal was originally located at the apex of the Coral Tower of Thras, but descended into the Abecean Sea and formed a whirlpool when the original Tower was brought down by the All-Flags Navy circa 1E 2260. It is possible that this whirlpool is the infamous Maelstrom of Bal. When the whirlpool formed, half the fleet of the All-Flags Navy were pulled into the maelstrom and transported to Coldharbour, where they fell from the sky and onto the dead landscape below. The fleet was believed to have vanished without a trace by the citizens of Tamriel, save for a compass stored in Rulanyil's Fall. Many members of the crew survived the fall, and the captain of the Golden Era made a pact with Molag Bal. He became the Lost Fleet Admiral and was given the Crown of Bones, cursing himself and the sailors to eternal undeath as skeletons, but allowing him total control over their actions. The admiral commanded his crew to begin construction of a new Coral Tower, hoping to use it to reach the portal in the sky and return to Nirn. The Lost Fleet Admiral was slain by Tamrielic invaders in 2E 582 and construction ended on the Coral Tower, although it is unknown if the skeletal sailors were freed from the control of the Crown of Bones. This page was last modified on 10 December 2018, at 00:42.